For a list of other Bridal houses/ shops/ studios, click here. All in all, BTBs are satisfied with the service of Mon Liza. They appreciated the MUA and PG's (nuptial initial) commitment for the fun PS adventure. The MUA, Mr. One did a fantastic job delivering good customer service and creating amazing bridal makeover. 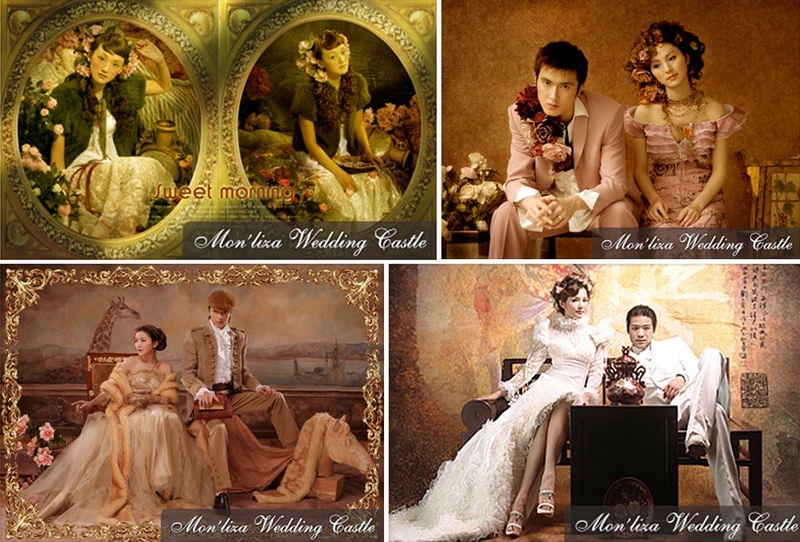 Their senior PG Michael is the specialist behind Monliza Bridal House's many master pieces. Not all PGs receive the same admiration though. A small number of dissatisfaction come from the quality of certain PG and the product delivery after PS. After an inspection through the photos I must say they are very unique and artistic! love it. The brides can play dress up and have a princess wedding in a castle. There is a selection of vintage costumes; fashion of the 18th and 19th century, lace, crinolines, corseting and embroidery, for you to look out of this era under the special theme shooting. Positive: I am not impressed with their sample photos. I find them a bit old-fashioned. What I like though, is that they said that since they have tie ups with a Swarovski jewellery business, they will allow Mon’Liza clients to wear their Swarovski jewels for free during the photo shoot and the actual day. The package at Mon”Liza was cheaper than other bridal shops I went to so I signed up with them. My package was only RM1888. There isn’t anything to worry about if you engage Mon’Liza to be your bridal shop. Their makeup artist, Mr. One; their photographer, Michael; and their SA’s Carmen and Wendy are all very nice, helpful and very patient indeed. I have only high praises for them because they have so many customers but they are still able to give each one a personalized service. I must say they are an excellent bridal shop! Negative: Mon’Liza gave me a lot of disappointments during my gown selection and photo shoot. Before I signed up, I told them I had a particular design of gown in mind and that’s what I want. The SA told me they will have new gowns in that design soon so I decided to sign up. When it came time for my gown selection and I was looking for my new gown, the SA told me to choose another gown instead because that particular design will not suit me! During the photo shoot, on the other hand, the photographer was very mechanical in making us pose for the pictures that the photos turned out awful. They have many type of costume, and their service was awesome because they are very passion to listen what you want, and giving the best thing for you! They will trying their best to give you a perfect wedding! Thanks so much for the information. Which bridal house you have chosen? Went to the Midvalley bridal fair, the marketer was kinda great, not pushy and explained the details professionally, we took the package. After the experience and digging more info from the web, I found there are other BS which offers better deal.